Gus resently had a sale on swords he had in stock that inspired me to do the same. 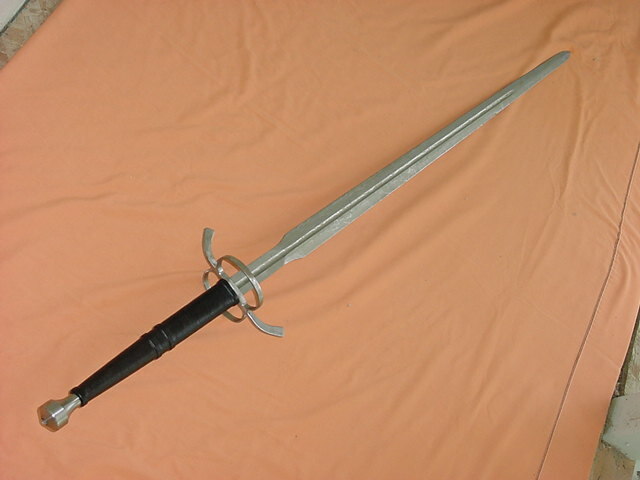 Check-out the reduced prices on the Gus Trim swords in stock at The Armoury. I got in one of Gus' new singlehand Sabers mounted with a sidesword hilt. 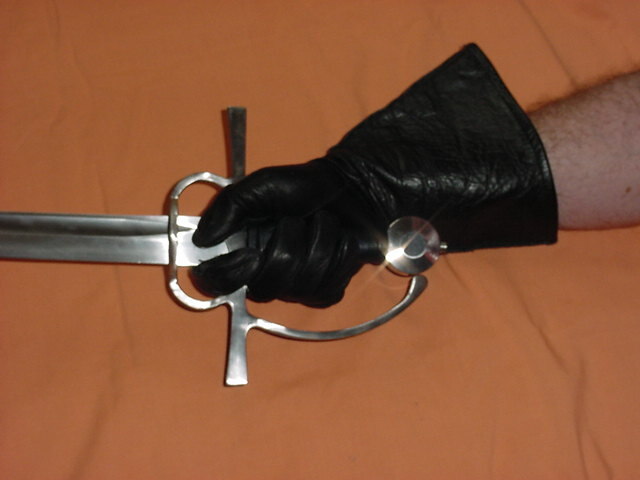 The addition of this type of hilt allows you to loop your finger over the guard for greater blade control. I'll have it up on my site later today, but just wanted to post a quick picture for now. Thanks for posting this stuff. 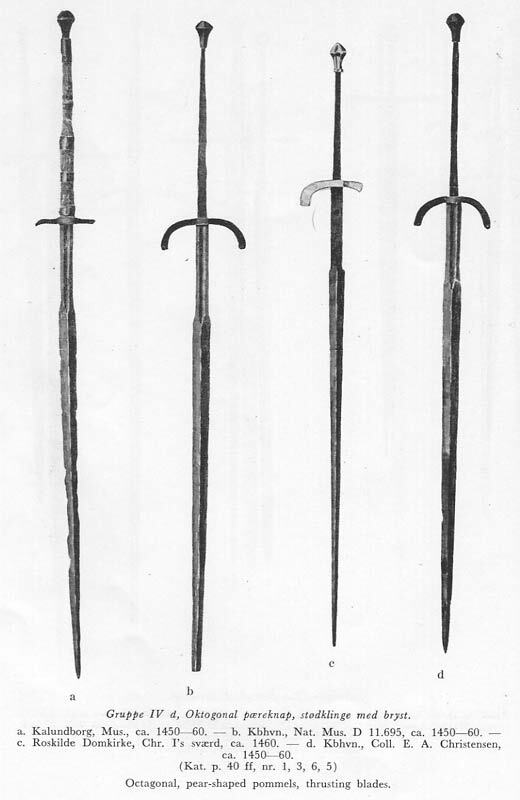 It's cool to see the much-talked about sabers "in the steel." By the way, you can attach mutliple pics in a single post (unlike some other forums). Just attach one, then keep attaching more until you hit "Submit." It's a little faster and easier for the poster. Photo that way, that's why I posted in more than one post. 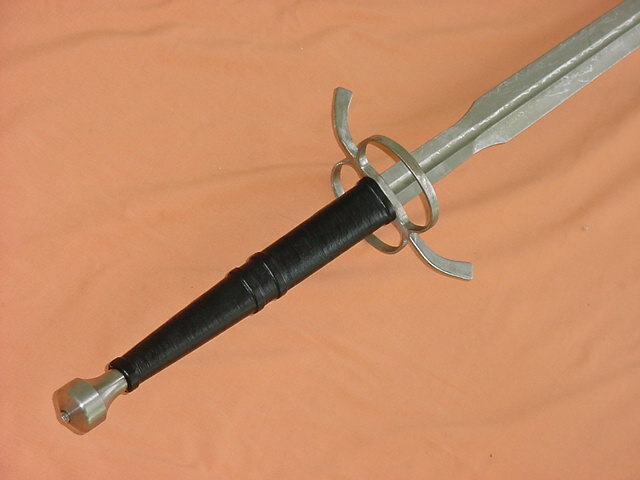 By the way, this saber handles great and the edge and point control with this hilt is great. No big deal at all, Lee. Hey, that's pretty interesting. I've never seen anything historically like that, but I suspect that wasn't the intention. As has been said, and Gus confirms, it's likely a good cutter. I suspect that was the design criteria more than the other. Pretty neat. 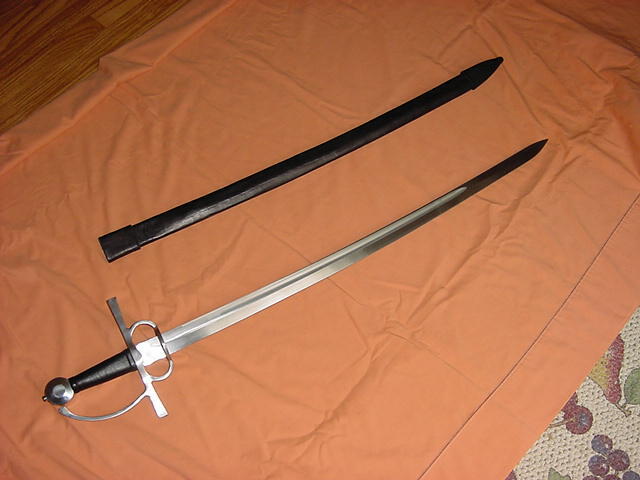 I also have in a new AT1592 Long Sword with side rings. I am having trouble getting the page to load at my server. for now here is a couple of pictures. Blade Width after ricasso 1 1/3"
Width of Guard 7 1/2"
I was a little hasty in throwing togather the stats. I'll make thos corrections before loading the page on my site. Why does the blade finish look so rough on this one? Thanks, Gus. Now that you mention it, I can totally see that and it makes sense! The addition of the side rings, and even more importantly, the more "rounded" downsloping cross-guard does wonders for that sword. It's proportions look excellent. I wanted to leave the coating on the blade before I shipped it to a custmer. I hoped it would photograph better than it did. I guess I'll have to clean one of the swords up before taking photos to put on my site. And, as for the site. I haven't gotten the main AT page to load all weekend. I have a call into my web guy and hope to have the main AT page up this morning. I am in dire need of space. Checkout the items I have in stock and basicly make me a reasonable offer.